There are times when something sweet, comforting, even old fashioned, is exactly what the doctor ordered. For me, it could be a sponge cake with fresh whipped cream and strawberries, an apple and rhubarb crumble or a short, crumbly crostata with homemade jam. But some Italians might find that a torta di semolino, semolina cake, brings a smile of nostalgia as they recall their grandmothers making this delectable yet simple, humble cake. This cake’s main ingredient is, naturally, semolina (also known as semola or semolino) or durum wheat flour, a coarse, pale yellow flour used in making couscous and fresh pasta, particularly pasta without eggs, a tradition of southern Italy. 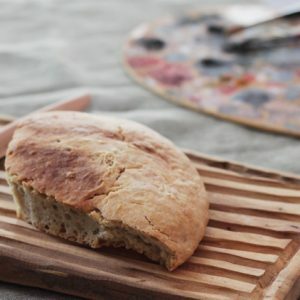 While semolina is quite coarse in texture, a finer semolina flour is also made with further grinding; this is often used for baking bread, such as the delicious pane di Altamura from Puglia. 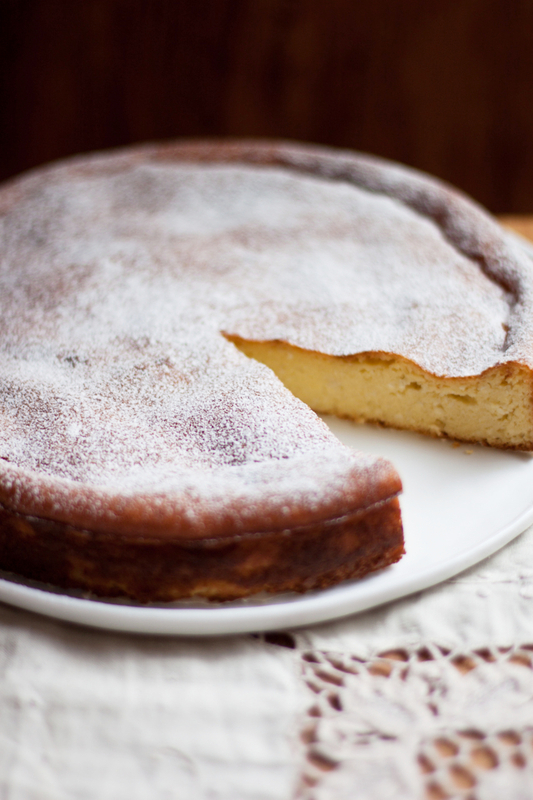 In this recipe from Pellegrino Artusi’s 1891 cookbook, Science in the Kitchen and the Art of Eating Well, the semolina is cooked with milk until it becomes soft and creamy like polenta (for Americans, you might compare this to Cream of Wheat), giving the cake a dense and moist texture, quite like a baked cheesecake with some hand-ground almonds and a hint of lemon to enhance the texture and flavour. Recreating a recipe, particularly a cake recipe, from the late 1800s in a modern kitchen can require a few adjustments before getting just right. In the nearly 800 recipes of his book, Artusi does not give any cooking times or indications of heat (which is just as well, considering the different ovens that were used then – he often makes reference to woodfired country ovens) and he assumes that many processes or techniques, such as blanching and peeling almonds or cooking semolina, are already known to his ‘housewife’ readers so he does not go into details. Consider too that ingredients such as eggs would have been largely home grown at the time and were likely to be much smaller in proportion to today’s common supermarket eggs. So the recipe below has been adapted slightly and expanded to better work in a modern kitchen. Use fine semolina as opposed to the coarser type available. If you’re lucky enough to have your own eggs or can use smaller eggs, then stick to Artusi’s 4 eggs, otherwise 3 larger eggs will do. Prepare almond meal by first removing the skins of the almonds. This is easily done by blanching them quickly, then squeezing the skins off by hand. If you already have peeled almonds, go ahead and pop them into a food processor to finely grind them together with the sugar, added one tablespoonful at a time, then set aside. Note that Artusi advises doing this step in a mortar and pestle, which I have to say will give you smoother results than the food processor. A food processor leaves the almond meal slightly rough and a little uneven. By pounding the almonds by hand in a mortar and pestle you will extract more of the oil from the almonds resulting in a finer paste and a smoother textured cake. Combine the semolina with the milk in a pot over low heat and whisk constantly to prevent lumps or burning. The semolina takes about 8-10 minutes to cook. As it cooks, it should thicken and when tasted it should feel soft and creamy on your tongue, not grainy. Just before taking it off the heat, stir in the almond meal, the butter, lemon zest and pinch of salt until combined. Allow the semolina mixture to cool before adding in the eggs. Once combined, pour the mixture into a greased and floured (or lined) cake tin large enough that the cake is no more than 1 ½ – 2 ‘fingers’ (as Artusi indicates) in height. A 26cm or 10 inch diameter round cake tin should be perfect. Bake at 180°C for 50-60 minutes or until set and evenly golden brown on top. Beautiful cake. So simple but a sweet touch of elegance! It looks ever so delicious! A wonderful speciality. Simple, easy to make cake. Do you think I can substitute the blanch-peel-ground process with store bought ground almond (almond meal)? A Beautiful cake I wouldn’t mind having a generous slice of right now with a cup of tea and a good cookbook to read. My favorite desserts are simple, not too sweet, and a bit buttery, so this Semolina Cake is right up my alley. I’ve just bought Artusi’s incredible book from amazon, having been inspired on a cookery course in rural Umbria. 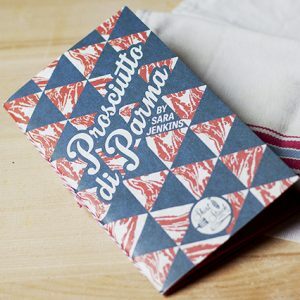 I’m just about to start learning Italian and French at university (after a gap year staying with Italian foodie friends in Umbria and Lombardy) so I’m really excited about discovering more and more from the recipes as my languages improve. Isn’t there something amazing about translating recipes, it makes me feel like I’m peeking through the door of a secret kitchen… I’ve just started translating a few french recipes on my blog and it makes me shamelessly excited. That’s wonderful, I hope you find Artusi full of inspiring things! And I’m equally intrigued about your mum’s almond and semolina slice – sounds wonderful with blackberry jam! Thank you, I’m sure I will! I’ve just done a blog post with the recipe for my mum’s almond and semolina slice (http://itstartedwithstrawberries.blogspot.co.uk/2013/01/mums-almond-and-semolina-slice-with.html) so feel free to have a look if you get the chance, I’d love to hear what you think. That looks delectable – and quite different in terms of texture to this one! I must try it. There’s nothing like keeping alive an old family recipe. Our neighbour in Italy always used to make us a cake like this for when we arrived, tired and hungry, from the UK. She’d leave it covered with a tea towel in the middle of the kitchen table and we’d dig in, devouring huge slabs. It used to last for absolutely ages and although quite plain it’s one of my favourite cakes to this day. 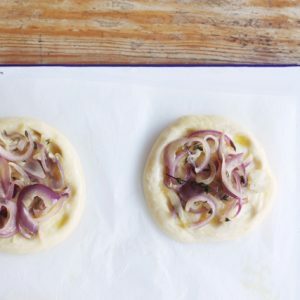 Yours looks absolutely delicious too – must make! I love this story! What great neighbours you have! I love that it doesn’t have to be a ‘fancy’ cake but that something humble and homely like this is capable of making people happy! I recently picked up Exciting Food for Southern Types by Artusi in a sweet new Penguin paperback edition. He had me at the sentence “Life has two principal functions: nourishment and the propagation of the species”. How wonderful! Two of our most basic desires as human beings are designed to be incredibly pleasurable. 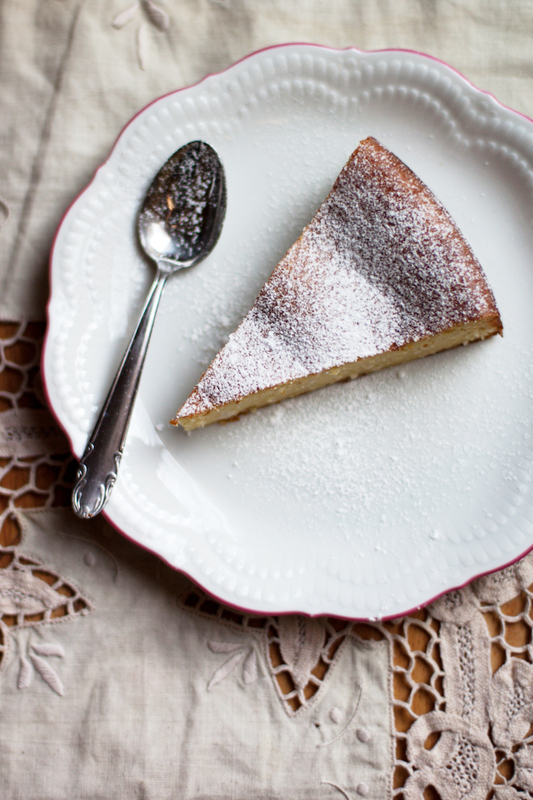 I am very much attracted to the simplicity of the semolina cake as it’s exactly how I like to cook and eat. Wonderful! I believe that’s quite an abridged version but it does have some of my favourite recipes (and their accompanying anecdotes) in it! Love that quote. This is my first visit to your site. Where have I been all these years! I came from Karen’s site Family Style Food, and I owe her great thanks for directing me here. This recipe is more intriguing to me than I can say. My husband adores Cream of Wheat. He also adores lemon cakes. This looks and sounds wonderful. Complimenti! Glad you stopped by Adri! I’m dying to make this. I don’t have a scale and I’m having a bit of trouble converting grams to cups accurately. Any suggestions? Thank you! Here in California we have what is called CSA’s (community supported agriculture). You pay a fixed price each week and you get a share of the farm or farm’s harvest. You can also add on a variety of item that are either seasonal or available all the time. This week I purchased some raw pistachios. They are so delicious and I want to use them in a dessert. I’m thinking they may make a nice addition to this cake instead of the almonds. I’ll let you know how it turns out. I did this cake with pistachios and added rose and orange blossom water for a Mediterranean twist. It turned out well. The texture is a bit to custardy for my taste. I missed a crumb. Thanks for your feedback Tina, yes as I described in the post this cake reminds me of baked cheesecake in texture – I wouldn’t say it’s like custard but it definitely has that smooth, soft texture, not at all a cake with crumb. Very sorry if that’s you were expecting something quite different! 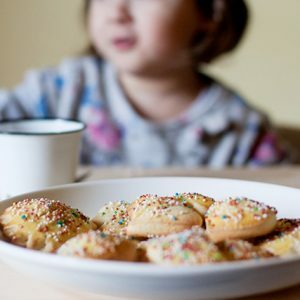 If you think about there is no use of flour like a traditional cake but the semolina is cooked to a creamy consistency like polenta, porridge or Cream of Wheat, and that is what makes it so cheesecakey – ground almonds also contribute to the moist, dense texture of the cake so there is little to give it a crumb but rather a smooth, pudding-like cake. sure anymore. Which one is ‘Artusis choice’ ? 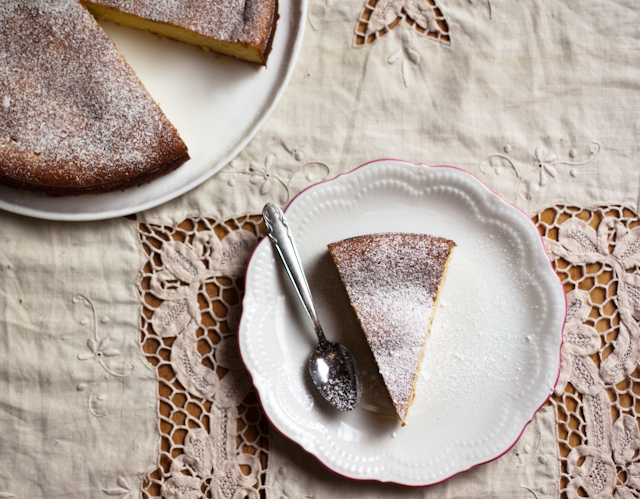 Good question – the durum wheat semolina is perfect for this cake. The colour may also come from the 4 eggs used in this recipe – I used fresh eggs from a friend’s backyard hens! Hope it turns out well! translated into durum wheat semolina this week. Just trying to make this cake. I’m puzzled by the ratio of semolina and milk. The 130 g of grain just disappears in a whole litre of milk. Are the measurements correct? Absolutely! Just try it, you’ll see – as in the instructions, as the semolina cooks in the milk it becomes thick and creamy (like a bechamel sauce). The final results are a creamy, pudding-like cake, a bit like a baked cheesecake – it’s one of Artusi’s famous and most beloved recipes! Never mind, turned out great! This recipe was disappointing because I followed the instructions as described and ended up with an overflowing and textural mess. The result I ended up with separated into a gummy base, eggy layer on top of that and then a hard shell top from the ground almonds rising to the top. Such a shame after I had such high hopes for this. For anyone wanting to recreate what is in the photos – beat your eggs til very fluffy (more than suggested). This recipe could be better with photos of how you are cooking your semolina. I’m guessing that low heat for 10 mins is undercooking it. Hi Sharna, sorry your experience with this Artusi recipe didn’t work for you. Half the problem with recreating a 19th century recipe is re-working it with a method that we are used to today! The semolina only needs 8-10 minutes to cook (this is standard for semolina, it definitely won’t be undercooked after this time and I don’t believe this was the problem with your cake). It does sound like an egg problem to me, though in my experience I haven’t ever had to beat the eggs excessively for this cake. From what I have read about the gummy layer problem, it’s usually either inadequate beating of eggs or inadequate heating during baking.